Coupons are great. Who doesn't like saving money on stuff? (Or better yet, free stuff.) But we can all agree that keeping track of coupons is awful. With this in mind, Google introduced the Save To Wallet API way back in 2012. It was a pretty simple way to transfer loyalty card or coupon information directly from a webpage or email into the Wallet app. Unfortunately, Android apps didn't get this same feature until two years later (yeah, this was clearly a priority). Then the whole Wallet reorganization happened and Android Pay was born. The "Save to Wallet" API was renamed "Save To Android Pay," and pretty much everyone proceeded to continue ignoring it. A few companies here and there do offer it for loyalty programs, but its real valuable use - as an automatic coupon clipper - remains largely unexploited. Where am I going with this? If you're in the US and at all pay attention to the news, you'll know that Chipotle has had a bit of a problem with getting its customers sick of late, and if you know that much, you probably also know they offered everyone a free burrito on the day they closed Chipotle stores nationally for an all-hands meeting. And the particularly good news about that burrito is that Chipotle, as far as we know, isn't getting anyone sick anymore! So you can probably redeem that coupon safely. When I went to do just that today, I expected to have to save a screenshot of a QR code or enter my email address to get the coupon itself. Neither of those things is terrible, but neither is quite as convenient as just hitting a button to add it to my digital coupon repository. 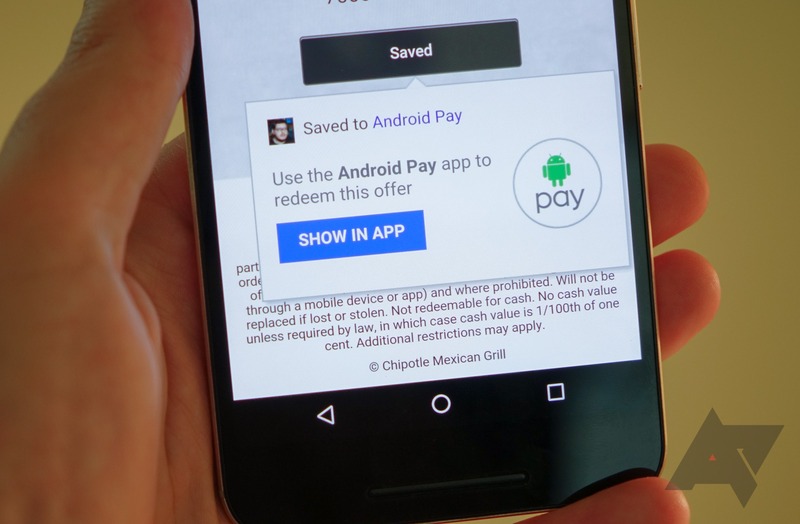 Chipotle to the rescue: someone had the good sense to use the web API for "Save to Android Pay." And it works. 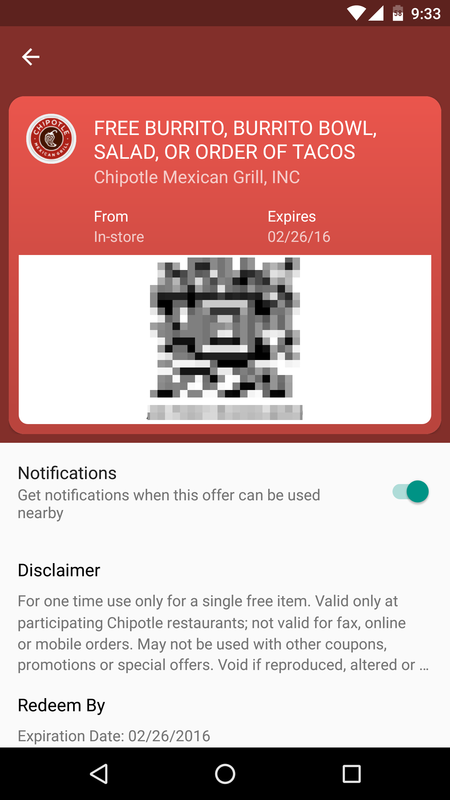 Just tap the button and your burritolicious coupon is stored in the Pay app, complete with QR code, number, terms and conditions, expiration date, and even the option for Android Pay to send me a notification about it the next time I'm near a Chipotle. Is it new? No. But it's certainly something I'd like to see used more often. A lot more.